Back problems are very common nowadays. Perhaps, it is because a lot of people are now experiencing it due to our lifestyle. Back problems are so common to people who are working in offices while sitting from 8 to 12 hours a day. One of the most dreaded symptoms of severe pains running from the lower back all the way to the legs is called Sciatica. According to studies, millions of people around the world suffer from this. It sounds very uncommon but has actually affected a lot of people and could affect you too. That is why it is important that one must understand what it is in order to treat it right and manage the pain. 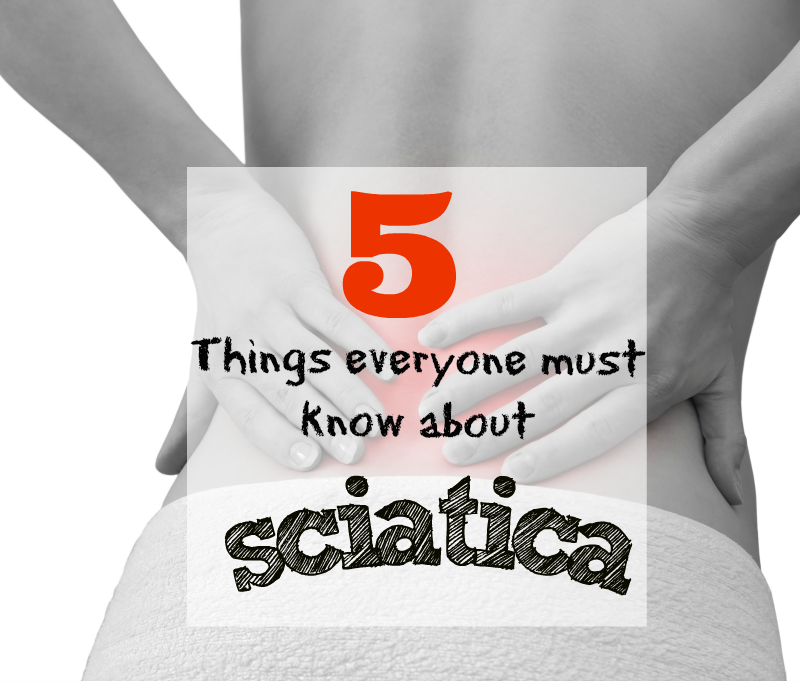 Here are five things everyone must know about Sciatica. 1. The sciatic nerve is the largest single nerve in the human body. Sciatica takes place when something puts pressure on the sciatic nerve which then ends up causing a sharp pain down a person’s lower back all the way to the legs. The sciatic nerve is the largest single nerve in the human body. It covers the whole lower spine all the way to the foot and it has an important role in connecting the spinal cord with your leg and foot muscles. If you experience any pain in any of those parts is referred to as sciatica. 2. One of the symptoms is lower back problems. This is the most obvious and common symptoms if you have sciatica. A person suffering from sciatica will experience an annoying, burning, and searing pain in the lower back. Back problems from sitting can also be experienced. Most of the time, the pain radiates all the way to the lower parts of the body. 3. There is a nonsurgical treatment for sciatica. There are several known treatments for sciatica and most of them are nonsurgical. Fewer people experience the chronic pain which is why only a few will ever have the need for surgery. These treatments can ease the pain you are suffering from. Acupuncture is known to relieve the pain after thin needles are stuck to specific points of your body. Massages, as well as a hot or cold compress, are also a good way to treat back pains. 4. It can be treated using epidural steroid injections. When the pain caused by sciatica has become severe, one of the last resorts when it comes to treatment is using an epidural steroid injection. Once it is used, it can directly take effect in the area in the sciatic nerve. It is effective, but it is not a long-term treatment. 5. The most common cause is a herniated disc. Having sciatica has several causes but the most common one is a herniated disc. What happens is that a disc in your back is torn and it bulges into your spine and sciatic nerve. This occurrence can irritate the nerve root that is why it sends a shooting pain on your back and all the way to the legs. Sometimes, the pain is just temporary but others also have severe cases with the pain lasting longer periods of time.